For No Smoking Day (9 March), boroughs and districts in Surrey including Epsom & Ewell Borough Council with the help of Surrey County Council's public health team launched a voluntary smoking ban in all children's play areas within council parks. Smokefree play areas ensure that children can enjoy playing in an environment free from smoke, reduce the likelihood of smoking related litter and fires and offer the potential for increased usage of the play area. 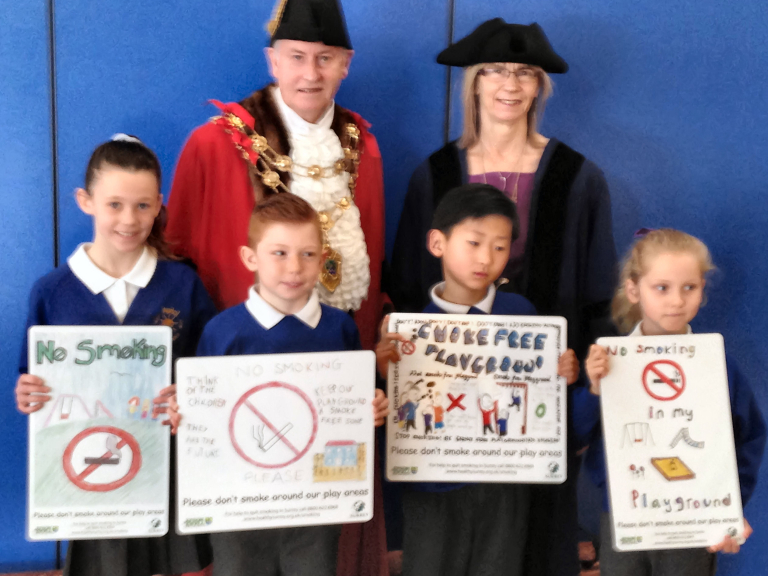 A competition was launched for local children in Surrey primary schools to submit eye catching designs with the winning entries featuring on new smokefree signs installed in children’s play areas in the respective participating borough and district. In Epsom & Ewell, the winning entries all from Auriol Junior School were designed by Ellie, Joe, Millie and Yujun. Councillor Jean Steer, Chairman of the Social Committee, said: "By making these playgrounds smokefree, we are offering our children a chance to enjoy play facilities without being exposed to other people's smoke. We all know that smoking is bad for our health and we hope that people will act responsibly and avoid smoking in these children's areas. "Well done to everyone who took part in the competition and congratulations to all our winners. The signs will help raise awareness and give other residents the confidence to raise the issue with smokers in the play area." Smokefree zones cover fenced off areas containing children's play equipment only. They do not include the rest of the park or other open spaces. The scheme will rely on the goodwill of people using them. It is estimated that each year around 207,000 children in the UK start smoking. Research shows that many of them take up the habit because they copy adult's behaviour. This smoking ban is not a change in legislation. It is a voluntary code which aims to encourage the community to make the decision to protect their children’s health and not smoke in play areas. 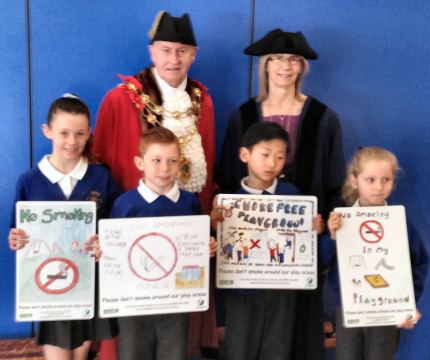 The Mayor, Councillor Chris Frost and Mayoress Councillor Liz Frost along with the winners of the Smokefree playgrounds competition - Ellie, Joe, Millie and Yujun from Auriol Junior School with their winning designs. 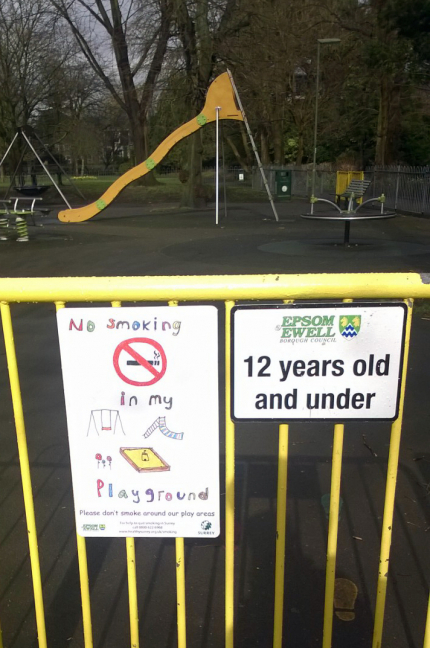 Smokefree playground signs installed in Epsom & Ewell play areas.